Because digital photography is “digital,” your camera not only stores your pictures as digital data, but also information about each picture, such as shutter speed, aperture setting, focal length of lens, etc. That is known as Exchangeable Image File, or EXIF, data. 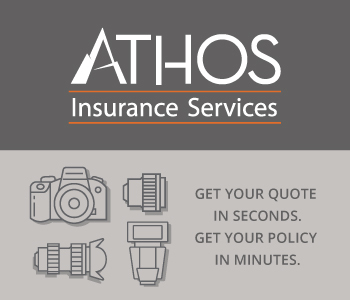 It is captured when you are shooting in JPEG or TIFF formats. The primary benefit of EXIF data is that you can compare images to learn from your mistakes and your successes. For example, you might not be happy with the depth of field in a photo. You check the EXIF data for the f-stop you used, so you can select a smaller aperture in the future to increase the depth of field. If you’re a beginner or even an experienced amateur, reviewing the EXIF data on an occasional digital photo will help you continue to improve your results. You can typically find EXIF data of your pictures in three places. Most DSLR cameras have a feature that shows the data if the photo is still on the memory card. One popular camera model has an info button that is pushed while in preview mode. Once you’ve transferred images from the memory card to your PC computer, you can access the EXIF data with a right click on the file, and then choosing “properties.” On a Mac, you select “get info” from the File menu. This option only reveals part of the EXIF data, however. 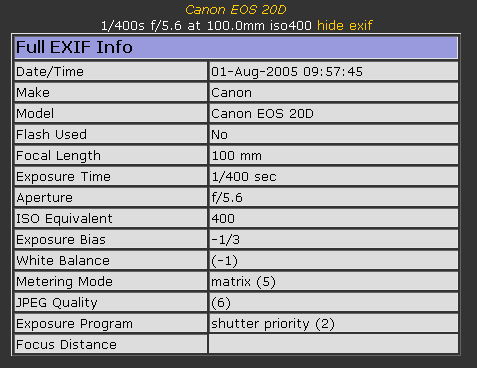 You can also view EXIF data with many photo-editing software programs. Check the manual for your program’s specific EXIF-data function. 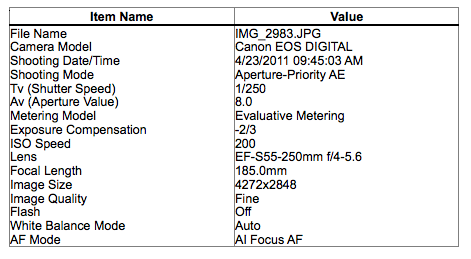 The following chart is an example of the available EXIF data. Make sure you are taking full advantage of the digital nature of digital photography, and the money you spent for a DSLR camera. Check and study the EXIF data of your photos to help you learn all of the components and functions of your camera and to become a better photographer.